Thanks for this Kristal,…….i’ve been going thru ups and downs……even “chucked” a journal I couldn’t feel anything for and then dug it outta the trash a week later!! !…….but still haven’t done anything in it………grrrrrr……….this blog post , I’m gonna use it as a fulcrum and tip the scales. I hope it helps Robin! How about starting by simply writing about why you don’t want to art journal? Putting down that first marks is always the hardest, but once you do things often start flowing from there! Kristal, thank you for your continued encouragement. I had posted before about my feelings of not being as good as my mother at art. She is a very talented realistic painter and I’m not. With fear of ridicule, I let her flip through my journal. She loved it! I am so grateful to you for starting me on this new way to express myself. I look at art journals and I drool. I want to start,but a paralizing stoke left me with only my nondominate hand.The result is I have difficulty in writing. I am able to paint and draw,but decent writing seems beyond me. 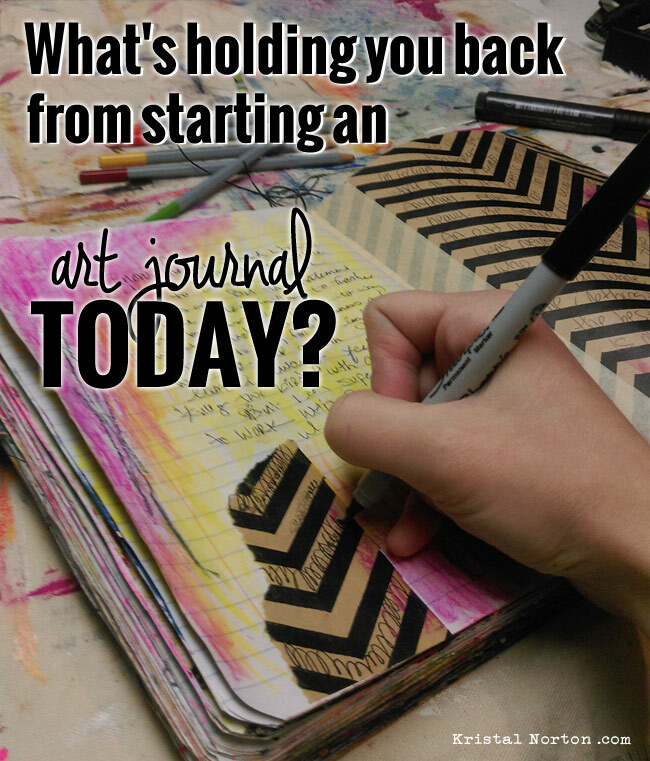 An art journal with writing,or the written verse,doesn’t seem to be complete somehow. Have you any advise,as I spend a lot of time on my own,and journaling would suit me? Thankyou. Some journal artists use their non-dominate hand on purpose! They say it’s the key to accessing your inner child and creativity. :) I love seeing childish writing in a journal. If it’s too difficult, or you’re just not liking it, could typing/printing/gluing be an option? Or perhaps some letter stamps? I feel compelled to respond to Dorrie’s comment as I can understand the physical limitations interfering with my creativity. 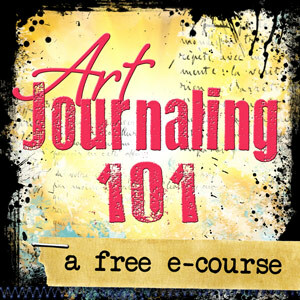 One method I have found helpful is to do digital art journaling. I use my laptop and only my laptop. It is an entirely different experience and forces me to find new methods to releasing my creativity. I will scan various materials I currently have, such as a photo or postcard or paper, and then use that as one of my resources. I also LOVE Etsy and the digital images I can purchase – and some vendors will send me free downloads just for being a customer. This is the perfect way for me to art journal and be creative on those days when I am traveling for work or need to physically take it easy. I hope this helps and happy creating! Thanks Kristal, my fear is not being enough. I suffer from depression and anxiety. They hold me back big time. I have all kind of supplies but I still can’t seem to get started. I would like to take online classes but I’m on a fixed income. So my fear is overwhelming. I hear you Pamela. This fear of not being enough is something that I think we all struggle with from time to time. Keep working with it. Acknowledging it is the first (and sometimes most scary) step. So it’s huge that you shared here. I don’t have a particular resource in mind right now, but there are a ton of exercises and things online to help you work through this. 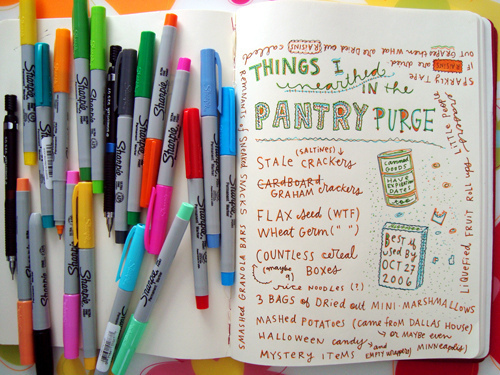 The funny thing is, art journaling is one of those things that helps, and yet it could also be a trigger! I’ve begun working in my journal! With paint, paper, etc. I’m even writing a little. Thanks so much for your inspiration….it’s helped me concentrate and I’m creating art as well! Many, many thanks! I’m beginning to use a long unused sketch book to try to learn to draw a bit!! You were one of the first artists that I watched when I started to research art journaling after my son died last year. You were encouraging, accessible, and adorable. You were the one who gave me the courage to begin. You kept reinforcing the idea that it IS all about the process. We all have our own unique talent, and should express it in whatever way feels natural and right to us. We are ALL ARTISTS!!!!! My art was dark in the beginning, downright depressing and sometimes angry. It was natural, and it was…..CATHARTIC!!!!!! I believe art journaling has saved my sanity and my life. 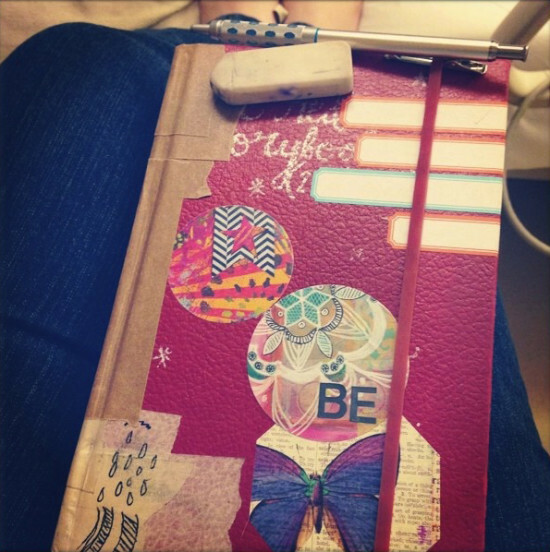 I miss my son each and every moment of everyday…but thanks to art journaling….I am working through it. It is still dark art somedays…but also, filled with light other days. It, and YOU gave me (and continue to give me) hope. And, although I have absolutely no training in art. I consider myself an artist of my own heart and soul. Words arent always necessary in my journal, and the depth of feeling still pours out and shows through anyway. So, I just wanted to thank you for your continuing inspiration, and let you know that you make a difference in the lives of all kinds of artists…. 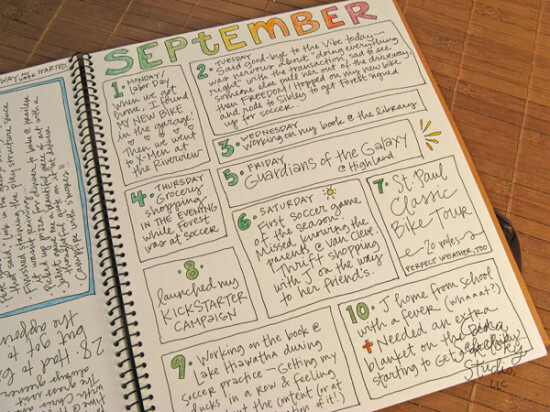 Beautiful work and I find the idea of an art journal rather compelling. Maybe I’ll take it up at some point and even get more organised in work.